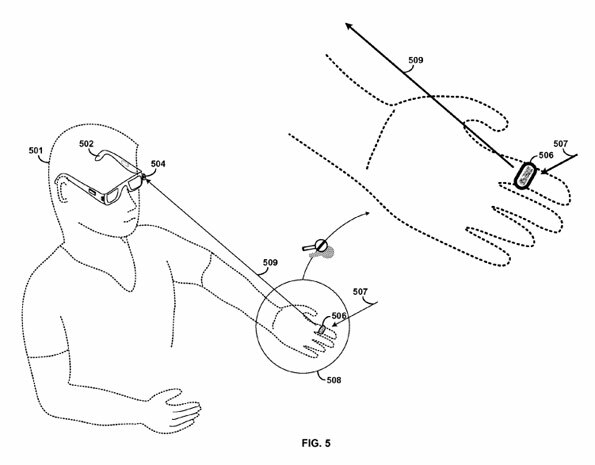 Google has been tearing through the bandwidth over at the Patent Office in defense of Project Glass, April’s much touted announcement of Google’s entry into the world of augmented reality and head mounted displays. One especially clever patent covers their bases on the use of glasses nose-bridge as a power switch. What a disappointment! Google’s prototype heads-up display glasses do not have the Terminator-style graphics shown in the concept video. They just show a simple readout above the user’s line of sight for now. That’s no fun. After the video came out, Google execs immediately started showing up at conferences and on talk shows wearing Google glasses. But they were vague about the actual capabilities of these prototypes. When Sebastian Thrun dared to demo the camera while live on the Charlie Rose show, the result was pretty harrowing. Concept videos cross the line when the company can’t deliver the goods. That’s why it’s risky to make them. As writer John Gruber is fond of pointing out, that’s why Apple stopped making such videos. Apple learned its lesson. Now it ships the devices of the future before it ever shows them off, leaving its competitors looking like they’re trying too hard.